I know, we have had it engrained into us that fat is the demon of the modern diet, it’s that tiny tip of the nutritional pyramid right?! Well I am going to turn that pyramid on its head (a bit). More and more research is condemning sugar, not fat, as the basis behind the majority of diet-related disease in the western world. When you eat good fats it helps to strengthen the immune systems, promotes healthy bones, provides sustainable energy, aids weight loss, and actually helps lower cholesterol. 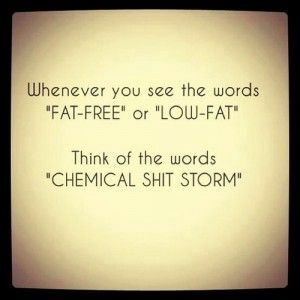 The problem is, food manufacturers have cottoned onto the falsely-promoted idea that eating fat, makes you fat. Our supermarket shelves are riddled with lo-fat products. Unfortunately these products are saturated with sugar. When you remove fat from something, you take away a lot of its flavour and its palatability, and what makes things tasty and addictive? The sweet stuff. The problem with this is that, sugar actually makes you more fat than fat itself, and it leads to spikes in sugar levels which only makes you hungrier – it is that hidden demon of the modern diet pumped into a lot of the processed foods that we buy. The other benefit of eating fat is that it is filling – in complete contrast to sugar which leaves us craving more. Fat (alongside protein) has corresponding appetite hormones which tell the brain we are full, so you can control your portions and intake. So fat can actually help us lose weight… who knew! And here is a bit of sugar quitting wisdom for you: Don’t think of touching fruit juice!! The average glass of apple juice contains 12 teaspoons of sugar, you may as well have a glass of coke. And as the sugar is in liquid form it hits the liver faster = much of this sugar will turn into fat. How dreamy.